Rachmaninoff's romance "I fell in love for my sorrow"
Born in Kuznetsk, she graduated from the State Gnessin Music Institute, going on to the Moscow Institute of Culture. She joined the Helikon Opera Company, where her roles include Olga Yevgeniy Onegin, Rosina Il Barbiere di Siviglia, Lusbasha The Tsar’s Bride, Nicklausse Les Contes d’Hoffmann, Marina Mnishek Boris Godounov, and the title role of Carmen. She participated in the Chaliapin Festival in Kazan and the Opera Festival in Cheboksary. She sang in the production of Tchaikovsky’s Iolanta in Vienna at the Klang Bogen Festival and appeared in the production of Weinberger’s Svanda Dudak at the Wexford Festival. She made her debut at the Bolshoi Theatre as Mother Superior in Prokofiev’s Fiery Angel, participated in the world première of Shchedrin’s Boyarina Morozova appeared in the role of Amneris in the production of Verdi’s Aida by Dmitry Bertman in the cooperation of Helikon Opera and Opera de Massy. She was the first performer of the monoopera Eva by Bardanashvili - the production was awarded the National Theatre premium Golden Mask and won the gold medal at the First World Championship of Performing Arts in Los Angeles. Her international career has taken her throughout Europe and to the USA Canada and Brazil. 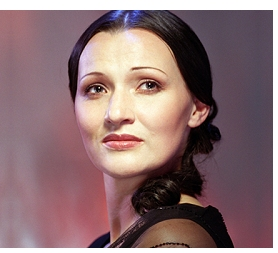 She is a guest soloist with the Mikhailovsky Opera Company and with the Bolshoi Theatre. Larisa Kostyuk has been awarded the title Honoured Artist of Russia. Richard Bradshaw; Evgeny Brazhnik; Theodor Currentzis; Valery Gergiev; Vladimir Jurowski; Vincent de Kort; Enrique Mazzola; Mikhail Pletnev; Vladimir Ponkin; Domenique Rouits; Gennady Rozhdestvensky. Weinberger’s Švanda Dudák; Granados’s Maria del Carmen (Naxos); Shchedrin’s Boyarina Morozova (Wergo); Scriabin Orchestral Works (Crochet).